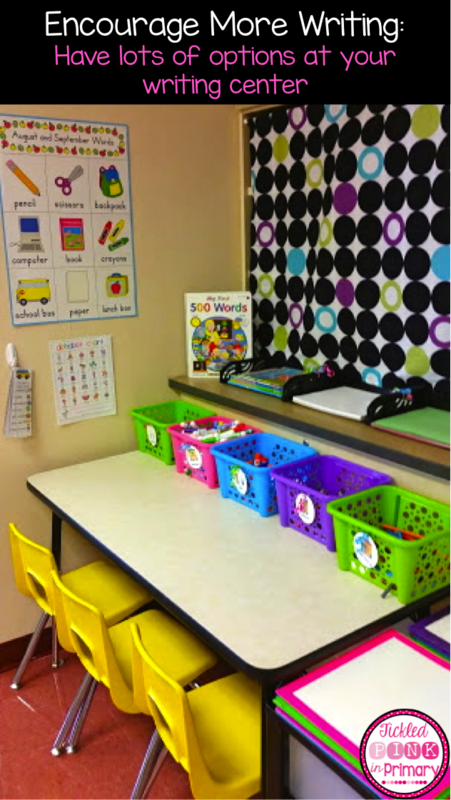 As you know by now, I love bright colors, polka dots, and organizing! I thought I’d share with you how my room is set up so that everything has a spot and is easy to find. My students learn really quick that Mrs. Lynch likes a clean room. 🙂 Even 5 year olds can be responsible and organized if you are willing to teach them. 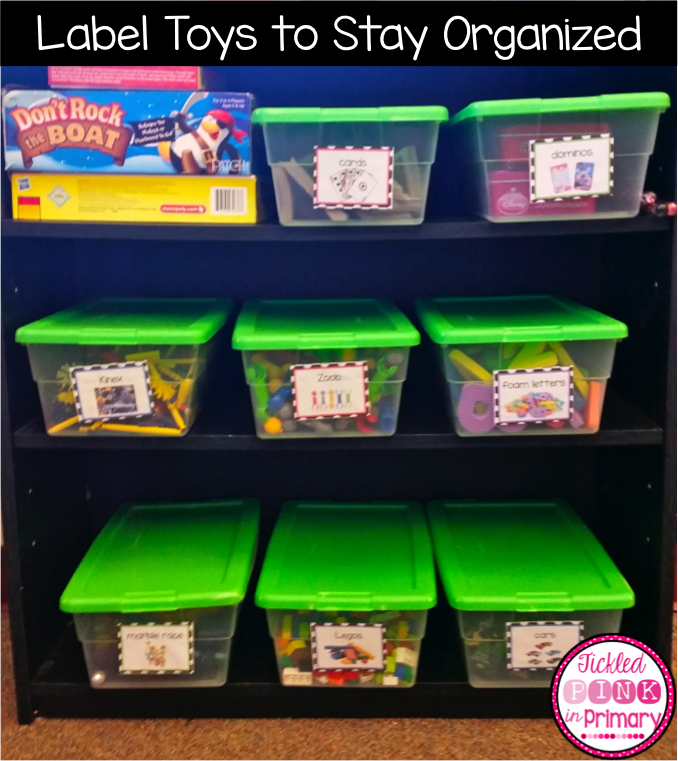 This Summer I organized all of my reading and math games, worksheets, and files into containers by skill. This will make is SO much easier to find what I need instead of digging through monthly files trying to find a rhyming game. I also organized all of my craft & office supplies too. The tubs all came from Target during back to school season. The medium tubs are 2/$5.99 and the small tubs are 5/$5.99. I got rid of my teacher desk and was amazed at home much bigger my room looked! I hardly ever sat at my desk b/c my computer was at a technology table for students to use too. I can sort papers, cut laminating, write notes, etc. at my reading table & have it serve as a desk and small group reading table. I go these containers at Dollar Tree for $1!!! Right when my students come in, they put their folder into the correct basket and get out any notes/money they need to turn in. This makes them responsible and save me time from having to check folders. Isn’t the tablecloth adorable, another Target find! All of my students have a number in the classroom. This saves me time each year, because I don’t have to re-label everything. Each number has a color too. 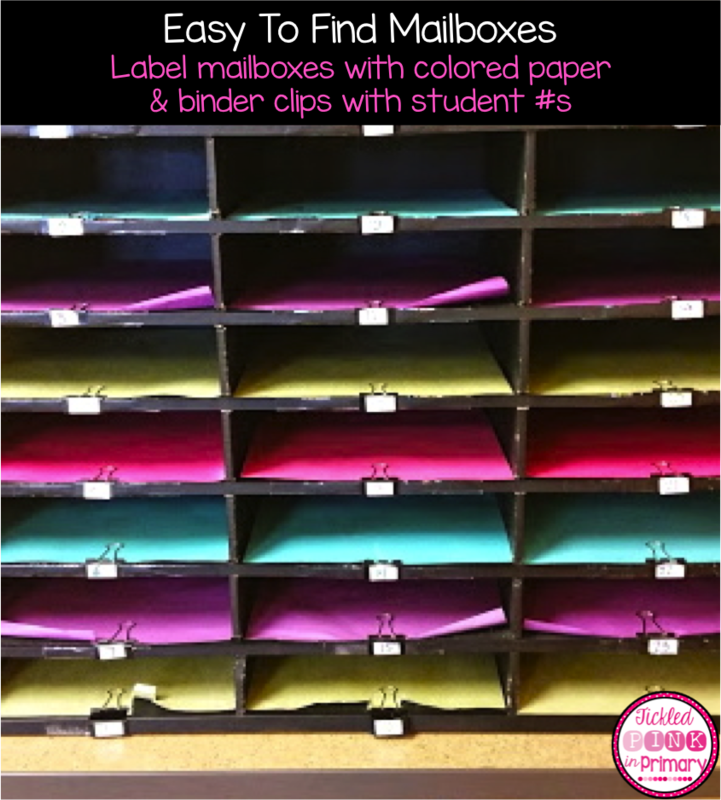 (EX: #1 is pink, #2 is blue) I use the numbers and colors on supply boxes, mailboxes, cubbies, clip chart clothespins, lunch choice clothespins, line order, etc. I add a construction paper to the bottom of their mailbox slot (probably should laminate & hot glue it on) and write their student number on the binder clip. All of my tables have a bright colored pom poms hanging over them. This makes it easy for me to say “green table line up” or “the blue table is the quietest”. 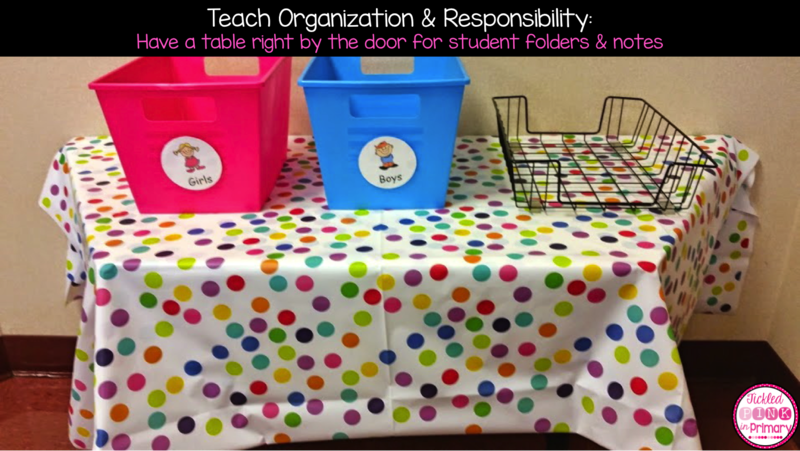 Students keep their reading, math, and writing notebooks and folders in these 3 cart drawers. 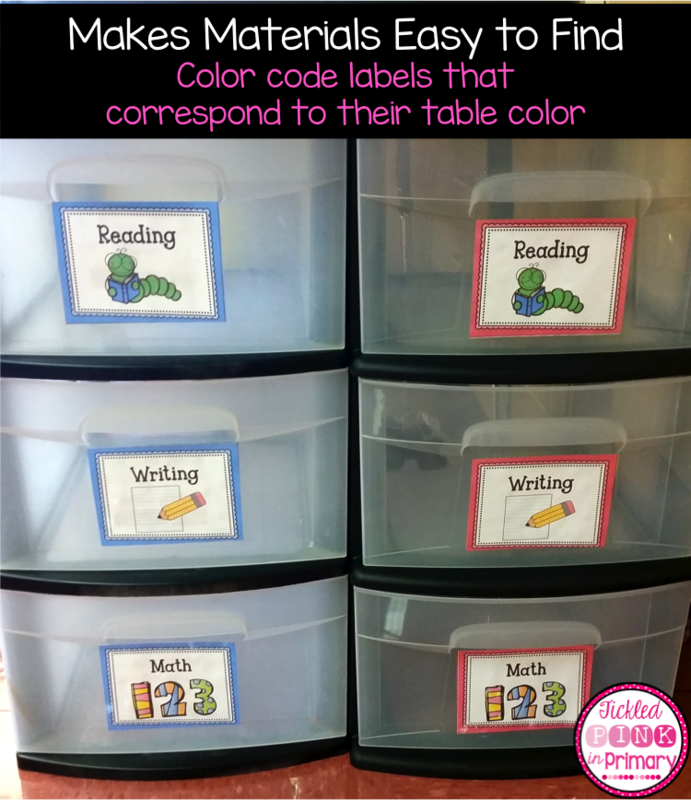 The labels correspond to their table color, so they know where to find their materials. I also have a table leader get all of the supplies out of the drawers. 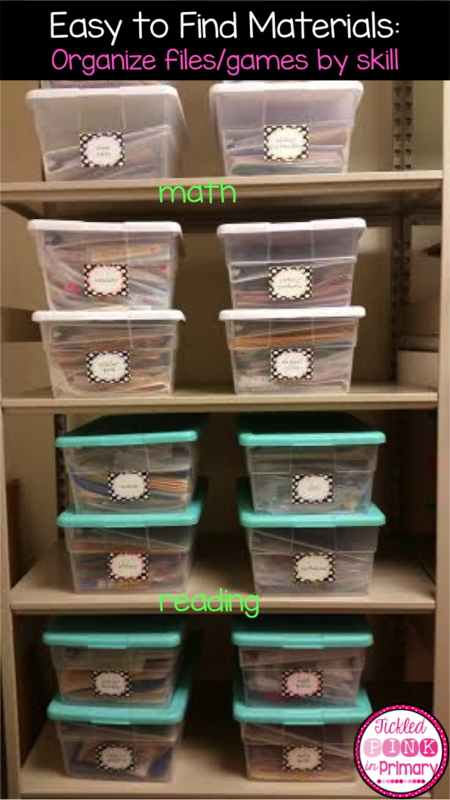 Each table has a supply basket that holds individual student supply boxes. 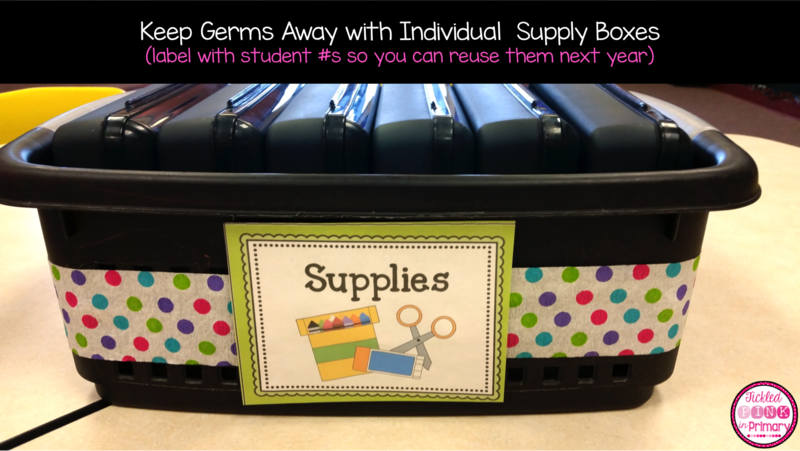 This helps keep germs aways and students don’t fight over the supplies anymore. I haven’t yet, but will label the top of the box with a sticker with their student number, so they can see which box is theirs. Each basket has a colored “supplies” label that corresponds to their table color. 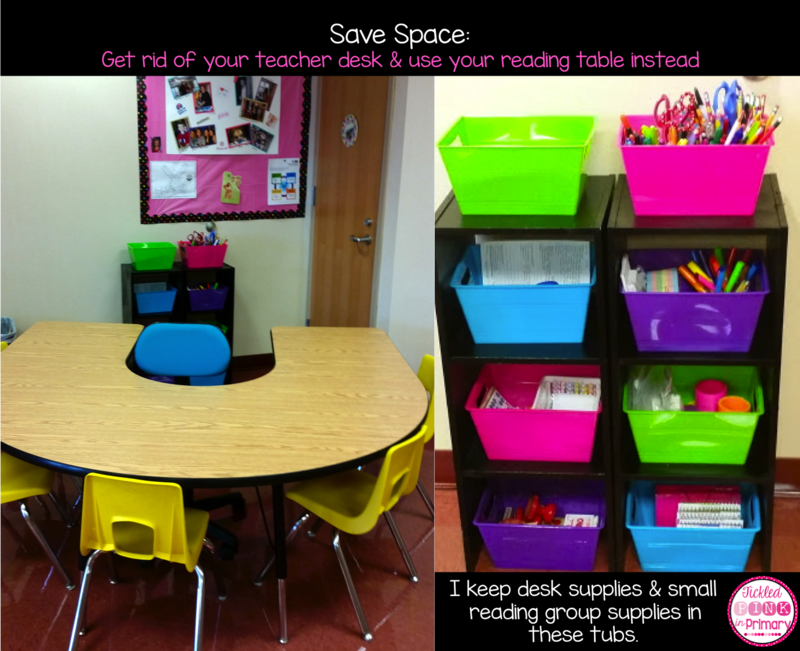 When students get new seats, they will just take their supply box with them to the new table. 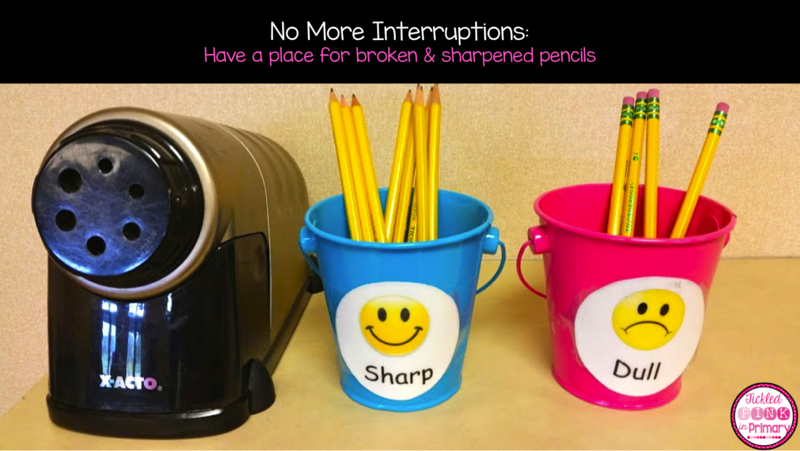 Avoid interruptions about broken pencils, by having a place for students to put the broken pencils and pick out a new one. My students don’t sharpen pencils and I don’t either during the day. Before or after school I check the cups to see if any need sharpened for the next day. These cups were found in the dollar aisle at Target. 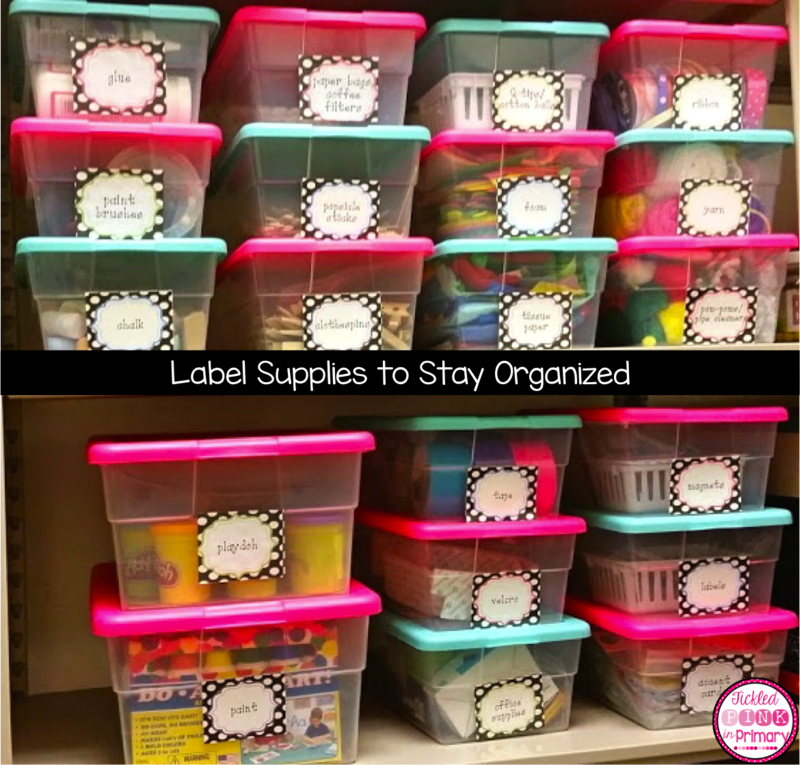 Another way to help students stay organized, is to label the toy containers. My students always clean up their mess and know exactly where everything belongs. Visuals are great for kids of all ages! 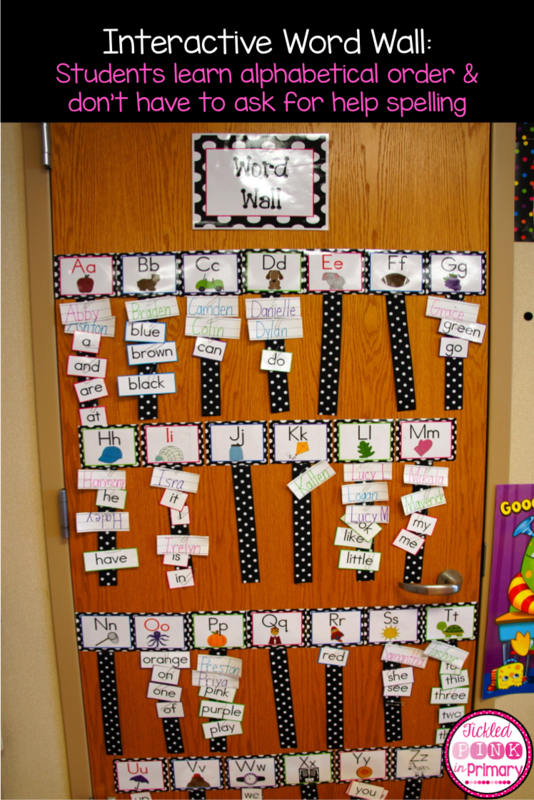 Having an interactive word wall makes students learn words and alphabetical order quicker. I never get the “how do you spell ____” question. My students know that I will just direct them to the word wall. My kindergarteners are able to use the word wall very well. They put the words back under the correct letter, they start to become more independent spellers, and learn how to use resources around the room. I simply used ribbon and paper clips to make my word wall. These word wall labels can be found in my Polka Dot Theme Classroom MEGA Bundle which includes some editable files along with many many more resources. One of the favorite places for my students to go is the writing center. I think this is because I provide so many fun things at the writing center that they don’t get to use during typical writing time. I have crayons, markers, colored pencils, construction paper, writing paper, copy paper, “how to draw” books from Usborne Books, kid dictionary, stencils, stickers, etc. For my job helper board, I put numbers on popsicle sticks and put them in library pockets. This makes it easy to change their jobs in and out. I use pictures of the students for my birthday board. Each kid holds a cake with the number of their birthday on it. This make it more personal for students and gives them a visual of who’s birthday month it is. For student transportation, I use ribbon and clothespins. If students change their transportation for the day, I just easily move their clothespin to the correct ribbon. I also attach there note from their parent to the clothespin in case I’m pulled out the room for some reason, a sub will see the note right by the door.